Somewhere between my early adolescence and yesterday morning, I got it in my head that cooking should be entertaining experimentation, and not just a means of achieving nourishment. Victoria will forever be my best friend, and is often the source of my culinary inspirations. But, when I came across an article on Pozharsky cutlets, which are somewhere between a croquette and chicken Kiev, I felt drawn towards the unknown to test my aptitude. I added pumpernickel bread as the spin, along with aged Parmesan Reggiano and fresh herbs. When these cutlets rest in the sauce they soak up the delicious mushroom essence, and achieve a “pillowy” texture, which brings out a subtle airiness of flavors. Although this dish would be most appropriate in the Autumn, rather than the middle of Summer, it was a worthy undertaking. Living life with an unequivocal sense of wonderment is something that was no doubt hardwired into me very young, and luckily has stayed with me ever since. On this evening, life served up a delectable meal that I got to share with my best friend and wife, who in the end, inspired my wonderment. In large bowl, pour milk over bread and soak for 10 minutes, then drain and discard milk. In food processor, pulse chicken until just smooth. Add soaked bread, egg yolks, nutmeg, garlic powder, thyme, parsley, parmesan, and season with salt and pepper. Pulse until combined. Transfer chicken mixture to a bowl. In a bowl, whisk egg white until foamy, and then fold into chicken mixture. Form chicken mixture into 1/3 cup patties, and place on parchment paper–lined sheet pan and refrigerate for 1 hour. Remove cutlets from refrigerator and coat in bread crumbs, pressing to adhere. Sprinkle with paprika on both sides. In large skillet over medium-high heat, add 2 tablespoons of oil. Working in batches, sauté cutlets, turning once, until golden brown, 3 minutes per side. Transfer to sheet pan and finish in 300°F oven for 5minutes. Add 1 cup of boiling water to mushrooms and steep for 20 minutes. Then drain and squeeze mushrooms, reserving liquid, then roughly chop. In same skillet as cooked cutlets, sauté onions for 5 minutes until soft. Then add crimini and porcini mushrooms, season with salt and pepper, and cook 5 minutes stirring occasionally. Add butter and flour and cook for 3 minutes. Add Madeira and cook for 2 minutes, deglazing pan. Then add reserved mushroom liquid and chicken stock, and bring to simmer for 10 minutes until thickened. Remove from heat and season to taste. Add cutlets to pan and let them absorb some liquid for 1 minute. 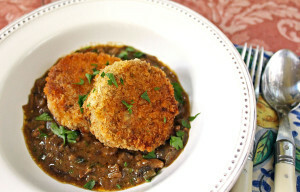 Ladle mushroom sauce into bowls and place cutlets on top of sauce. Garnish with chopped parsley. Recipe can be easily doubled. This entry was posted in Cooking, Fall, Main Dishes and tagged Mushrooms, Poultry by cfaust. Bookmark the permalink. What happened to the porcini mushrooms listed in the cutlet portion of the recipe? Never heard from again.